Despite note ban, India's GDP for the third quarter ended December, estimated at Rs 30.28 lakh crore, recorded a growth of 7 percent, the lowest in over nine months, but still higher than expected. The estimates of GDP growth for the full fiscal 2016-17 at 7.1 percent, marked a sharper fall from the 7.9 percent recorded for the fiscal 2015-16. 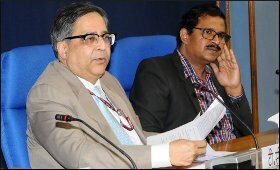 In terms of gross value added (GVA) -- considered a better measure of economic performance, as it excludes product taxes and subsidies -- of Rs 28.02 lakh crore for the quarter, the growth at 6.6 percent was slower compared with 7 percent in the previous year, mainly due to a contraction in the financial and real estate sectors. Within the GVA, the manufacturing activity showed a sharp fall in the December quarter at 8.3 percent, against 12.8 percent in the same quarter of the previous year. While construction growth fell to 2.7 percent, from 3.5 percent the year before, financial, real estate and professional services GVA during the quarter in consideration saw a massive fall to 3.1 percent, from 10.4 percent growth seen in the third quarter of 2015-16. However, government services, including defence, logged a robust growth of 11.9 percent, against 7.5 percent in the previous year. The primary sector, including agriculture and fisheries, bounced back impressively during the quarter in question with growth of 6 percent, against a decline of 2.2 percent in the same quarter of the previous year. Mining and quarrying output also recorded a major fall at 7.5 percent, as compared to the 13.3 percent growth a year ago. "Policies such as demonetisation are difficult to assess without a lot of data, a lot of which is still to come in. As of now we have factored in the third quarter figures on industrial production and only the advance filings corporates," Anant said. "The immediate data bears out the conclusion that it (demonetisation) has not had such an impact," he added. 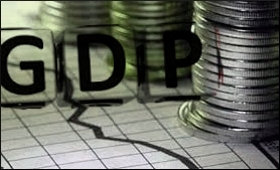 "Earlier estimates were projecting GDP at much lower level. We have to see the full play of demonetisation effect. Earlier reports were anecdotal," Economic Affairs Secretary Shaktikanta Das told reporters here.